The company founded in 1874 had a long tradition in the shipping sector. At the beginning the Company organized the transshipment of the goods from vessels into the so called “navicelli”, big barges hauled through the city and port canals to the warehouses where the goods were stored (the unloading and loading operations were carried out completely on the water). At that time the Company was still named under its founder “Odoardo Del Corona”. It owned more than 40 “navicelli” and some warehouses in the 17th century Livorno’s neighborhood called “Venezia Nuova” (new Venice). In the first year of the 20th century, after its founders’ death in 1888, the Company was carried out by his 3 sons who changed the name into “Fratelli Del Corona fu Odoardo”. In that period the main Company’s activity was the transport on its own navicelli of the limestone extracted from Calignaia cliff, in the South of Livorno, to Cementaria Italiana, a main Italian industry during the industrial revolution. The loaded navicelli were hauled in line by 5 coal-fired tugboats owned by the Company. Afterwards, until the end of World War I, the Company mainly dealt with the transport of English carbon, refractory, building materials and the chemicals of the growing Italian chemical industry. The cooperation with the company “Società Montecatini of Carlo Donegani” (a family friend from Livorno) is dated back to the 20’s. The business cooperation went on for over 80 years during which the Company always supported the growing of this big industrial group with its logistic solutions and shipping services. In 1932, after the death of the brothers Icilio and Ettore, Umberto Del Corona changed the company’s name into “Ditta Umberto Del Corona” until the merger with the Nuova Scardigli Spedizioni srl in 2001. 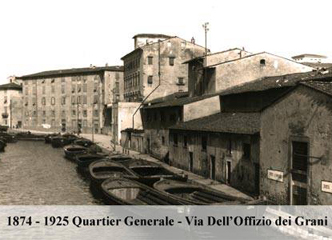 In this period Umberto’s sons Ettore and Odoardo, the third generation, took over the Company that had a part in the building of the current Industrial Port transporting by sea from Pisa the material extracted from caves and used to build up the docks. The Company, traditionally specialized in chemical and mining sectors and in dry food cargoes, started to deal also with other fields so that in the 50’s/60’s it was able to move about 600,000 tons of different products per year, mostly fertilizers, that were then distributed in the Italian and foreign markets. Changes in technologies and the introduction of the container system in 1970 deeply changed the sea transport dynamics. Basing on its tradition the company “Umberto Del Corona” aimed at satisfying the new needs and tried to develop its services according to the most updated solutions.